Eleanora Kaloyeropoulou crouched by the wooden planter box picking beets and kale. While this sounds like a scene from a rural or suburban landscape, she harvests these vegetables from a lot on Oakland Avenue. Kaloyeropoulou, a Pitt junior majoring in Africana studies and history, is co-president of the student organization Plant to Plate, which runs Oakland Gardens, a patch of greenery owned by the University. The organization grows all manner of plants, including fruits, vegetables, flowers and herbs in addition to making its own compost. Originally the project of a class on sustainable agriculture in the Honors College, Oakland Gardens exists as the result of efforts by many students since its conception in 2007. For about seven years, Oakland Gardens has donated the entirety of its produce to the Oakland Community Food Pantry located on Lawn Street, which is managed by Community Human Services. The Oakland Community Food Pantry partnered with the University of Pittsburgh and the Greater Pittsburgh Community Food Bank in 2009. The Oakland Community Food Pantry caters to people in Oakland who meet the poverty guidelines. It also supplies resources, programs and support to the homeless and those with mental health disorders. Plant to Plate harvests every Wednesday evening and takes its produce to the food bank as part of its weekly meetings. Unlike rural farming, urban gardening has the advantage of being in the same vicinity as its consumers. Last year, Plant to Plate donated 300 pounds of tomatoes alone to the food bank. Additionally, the garden has always been pesticide free and 100 percent organic. Because it was developed in the name of sustainability, Plant to Plate and the engineering students try to improve the garden consistently and keep its resources renewable. As Kaloyeropoulou pulled onions from the planter boxes, vice president Sarah Kenney was nearly indiscernible as she picked raspberries from the towering patch in the center of the garden. The raspberries and strawberries Kenney gathers are placed in plastic bins that are then transported to the food bank. “They’re ripe when they nearly fall of the stem,” Kenney, said, as she tasted a raspberry. Though the garden focuses mainly on yielding food, it isn’t devoid of more aesthetic plants. A plot of sunflowers sprouts next to the greenhouse, reaching heights of several feet. Golden-orange blossoms of nasturtiums — a variety of edible flower with a spicy taste — grow in the planter boxes. Although the flowers don’t serve the same purpose, they add some color to the rows of green foods. Some flowers function differently. The urban location means that herbivores, including rabbits, squirrels and deer, are less common but Kaloyeropoulou and Kenney said that marigolds are natural deterrents for those kinds of animals. Pigeons occasionally snack on fruits from the garden, but Oakland Gardens’ most notorious predator is a local cat named Pawsta who likes to dig holes. Initially, constructing compost beds and developing the compost proved to be difficult. Kenney, a junior studying biology, religious studies and fine arts, said the compost could still “use some love,” but Plant to Plate has improved it greatly. It’s made and maintained by the students and they’ve created two tumblers of fresh compost high in nitrogen to be used for leafy green plants like lettuce, cabbage and kale. Another kind of compost, vermicompost, utilizes worms to endow the soil with lots of nutrients. Kaloyeropoulou said “none of [the Plant to Plate members] are experts on everything,” so the garden has been a project of the masses. 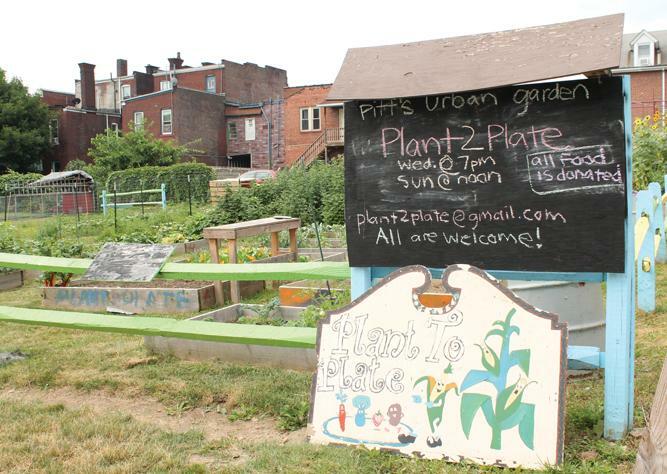 Organizations like Grow Pittsburgh, which is heavily invested in urban farming, advises Plant to Plate on the best means of management. Plant to Plate also receives feedback from Oakland Community Food Pantry and funding from the Student Government Board. Many of Oakland Gardens’ features are the products of engineering students and the projects from the Honors College’s sustainable agriculture class. Salvatore pointed out Oakland Gardens’ planter boxes, painted fence, grape trellis, greenhouse and compost beds as examples. Kaloyeropoulou said that engineering students also designed the watering system for the field. She said she hopes the next step will be a fully irrigated garden. Salvatore brandished a shovel and worked on filling in the holes Pawsta dug. He is the president of Engineers for a Sustainable World, another Pitt student organization, and takes his role very seriously. “[Plant to Plate’s members have] to work together to be sustainable,” he said. Currently, Plant to Plate randomly assigns one of its 30 core members to water the garden every day. Sundays are “work shifts” where everyone gathers to pull weeds and maintain upkeep. Throughout the year, Plant to Plate sees visitations from roughly 300 honorary members, which includes people like middle school students and sororities who come to harvest the plants. Even when covered with snow in January, Oakland Gardens keeps running and harvests hardy plants, such as kale, year-round. Strong winds blow seeds around the whole garden, so rogue tomatoes pop up in nearly every corner. Unpredictable weather doesn’t harm the plants anymore because they’re in an urban location; they are still resilient and continue to grow. This small garden strives to feed many people below the poverty line and allows students and the University to promote a sustainable future — in addition to providing a respite from South Oakland bustle. The organization thinks of Oakland Gardens as “an oasis in the middle of the city,” Kaloyeropoulou said.